Every once in a while, it is imperative for our sanity and well-being to have a gentle reminder to slow down. Not necessarily to the pace of a slow cooker, rather to the march of the long-forgotten Sunday dinner that simmered or baked for an hour or two, while we sipped coffee or tea and dreamed about the week, the future, that lay ahead. Remember those enticing aromas that slipped out of the oven when it was opened a crack to check, or to baste, the rosemary-honey roast chicken? Food often assists in creating emotions, why not make happy moments that will be cherished for years to come? One way to reconstruct the family dinnertime, is to serve meals that flood the home with tempting scents of familiar herbs: thyme, rosemary, garlic, oregano. 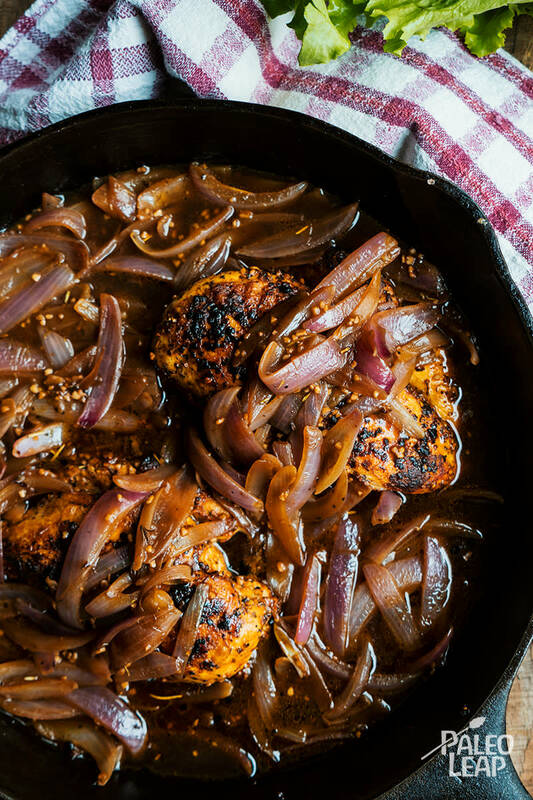 Combine those spices with breast meat, chicken stock and caramelized onions and you have a dinner worthy of a proper sit-down-family-meal. Do not limit your use of chicken to the leanest bites though, as chicken thighs will provide a more intense and delightful flavor, and while baking they will fill your home with an essence of a simpler past – one that we all secretly long for. This weekend, go for the juicy chicken, roast your garlic-butternut squash, play a card game and spend some quality hours with family and friends. Life is better when you share time together! In a bowl combine the dried onion, dried oregano, paprika, and generously season to taste. Rub the chicken with the onion-oregano mixture, making sure they are well coated. Melt cooking fat in a skillet over medium-high heat and brown the chicken 2 to 3 minutes per side or until nicely browned. Set the chicken aside and add the ghee to the same skillet. Add the fresh onion and garlic, cook over medium heat, stirring until soft. Add 2 tbsp. of the stock to the skillet along with the thyme and rosemary; cook until a bit caramelized, 5 to 6 minutes. Bring the chicken back to the pan, toss everything, pour in the remaining stock, and place in the oven. Bake until chicken is cooked through, about 15 to 18 minutes.